246 pages | 6 B/W Illus. 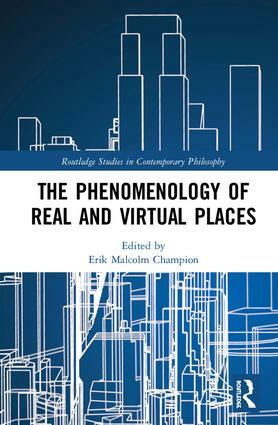 This collection of essays explores the history, implications, and usefulness of phenomenology for the study of real and virtual places. While the influence of phenomenology on architecture and urban design has been widely acknowledged, its effect on the design of virtual places and environments has yet to be exposed to critical reflection. These essays from philosophers, cultural geographers, designers, architects, and archaeologists advance the connection between phenomenology and the study of place. The book features historical interpretations on this topic, as well as context-specific and place-centric applications that will appeal to a wide range of scholars across disciplinary boundaries. The ultimate aim of this book is to provide more helpful and precise definitions of phenomenology that shed light on its growth as a philosophical framework and on its development in other disciplines concerned with the experience of place. Erik Champion is Professor of Cultural Visualisation in the School of Media Culture and Creative Arts at Curtin University, Australia. He is the author of Critical Gaming: Interactive History and Visual Heritage (2015) and Playing with the Past (2011).